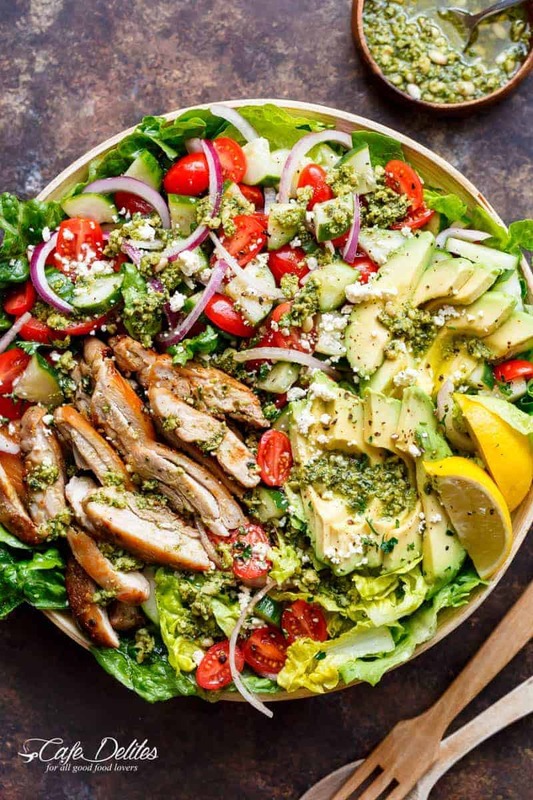 Move over boring salads…this Pesto Grilled Chicken Avocado Salad is here and will become your new favourite meal-in-a-salad! With another one of my USE THE DRESSING AS A MARINADE type of deal, grilled chicken fillets sit on top of this loaded salad, filled with cucumber pieces, sweet and juicy grape tomatoes, red onion slices, and crumbled up feta cheese! Plus added avocados — because WHO doesn’t love avocados? 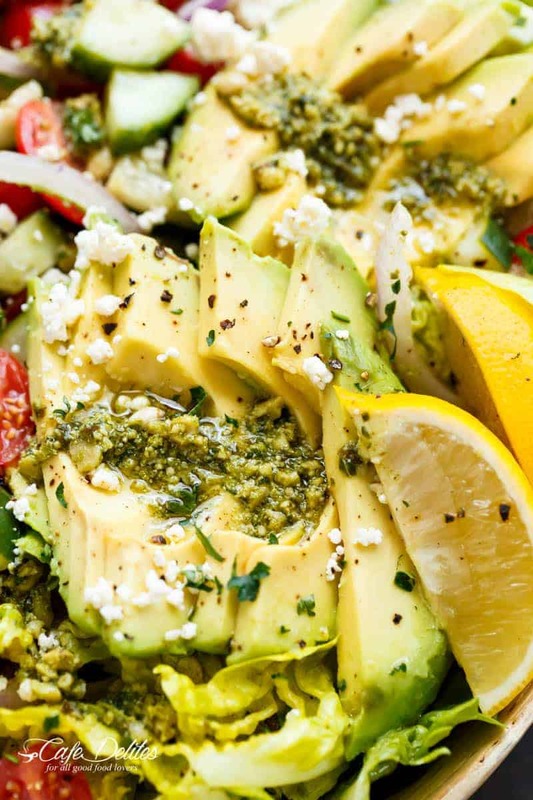 Especially in this Pesto Grilled Chicken Avocado Salad! People, let me tell you about my week. 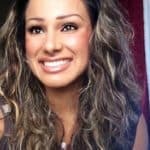 Not only have I had paper work coming out of my ears and have had to count figures and numbers on my fingers more than I’d like to care to admit; throw in one panic attack (okay, so a few), along with moments I forget to BREATHE (because breathing is an oversight when you start a company, am I right? ), and add that we have now expanded Entice Films to 8 (YES, EIGHT — I counted ON MY FINGERS) team members, WHO all need daily lunches (more like we need to feed them with the overflowing food busting out of my little kitchen), MY LIFE IS OFFICIALLY HECTIC! Oh, and a recipe book deal. YES! 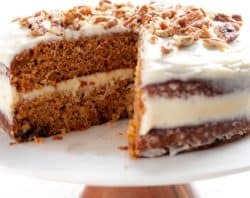 A CAFE DELITES RECIPE BOOK DEAL! BUT THAT’S NOT ALL. We are now videoing blogger baking videos. BAKING. Do you understand what this means? This means, GOODBYE DIET, NO WILL POWER, drowning in a never-ending ocean of cookies/brownies/pastries/cakes/slices/pies (oh, the PIES), and everything else dessert you can imagine. Start a food blog, they said. It’ll be fun, THEY SAID. That’s where this salad comes in. Ohhhhh the greens! The fresh crisp lettuce and the burst-in-your-mouth tomatoes! I have never been more excited in my LIFE to move a tray of cinnamon rolls to the side and eat a salad. Clearly, there is something wrong with me. The Pesto dressing though? That’s the ish. 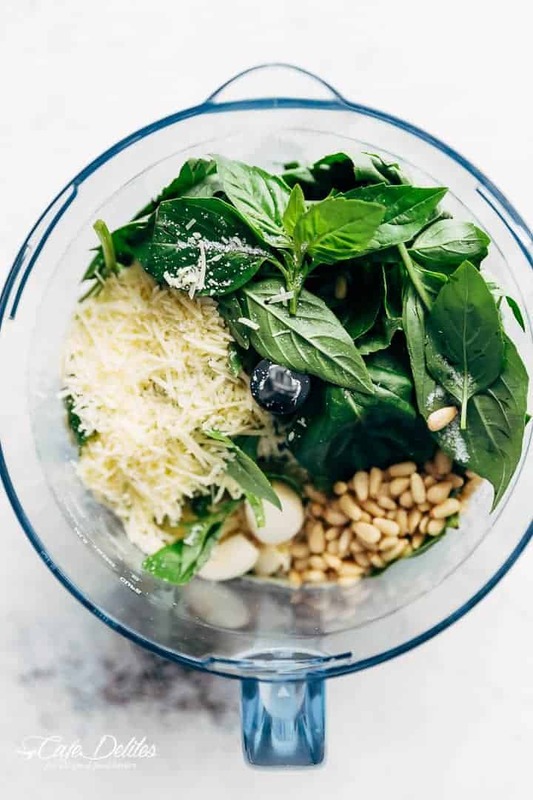 I added some olive oil, garlic, lemon juice to an already delicious basil pesto I made on my blog a while ago, and remade again earlier this week for absolutely no reason other than I’ve been craving pesto, and this salad came to be born. Now, as with all of my recipes, I give you the option of using either store bought OR homemade pesto. The choice is always yours. Ahhhh, GREEN, parmesan, basil pesto goodness. You will never regret the day you take your bowl of boring lettuce, and turn it into a Pesto Grilled Chicken Avocado Salad. Believe me. 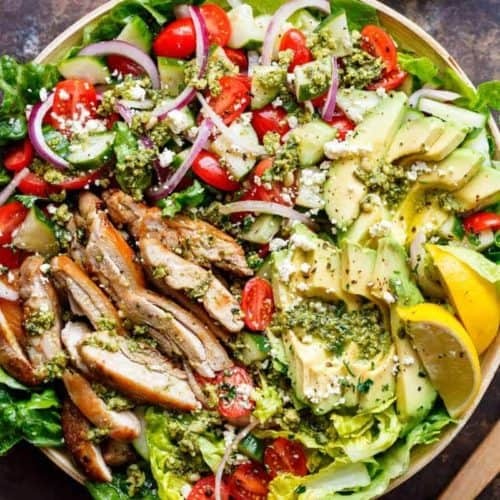 Move over boring salads...this Pesto Grilled Chicken Avocado Salad will become your new favourite salad, using a pesto dressing to double as a marinade! 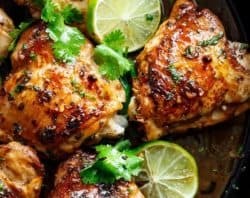 Allow chicken to rest for 5 minutes; slice and arrange over salad. Drizzle salad with the remaining UNTOUCHED dressing. Serve with lemon wedges, extra basil pesto AND chopped basil or parsley, to garnish. I recommend adding a couple tablespoons of oil to the extra pesto when serving your salad, before tossing! This of course depends on the thickness of your pesto. We like ours runnier for easier drizzling. You could also mix it with water to cut down on fat or calories, if you wish! 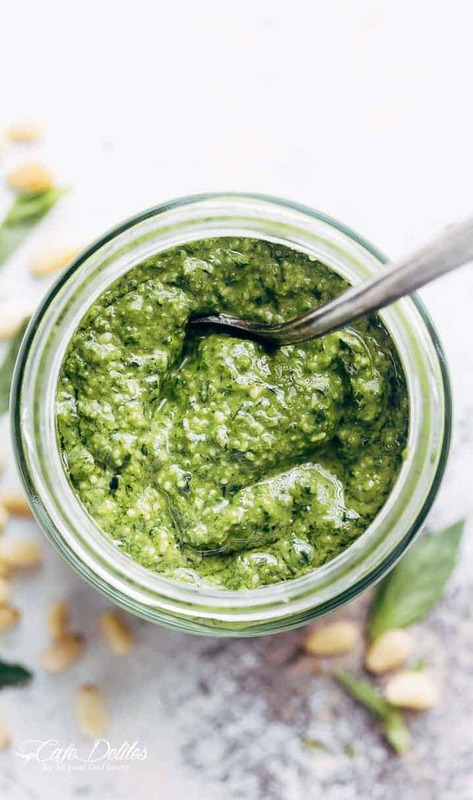 Use this homemade basil pesto recipe or store bought pesto! 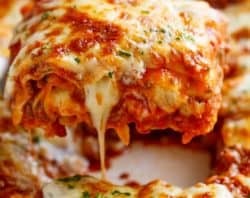 I made this today and all I can say is YUM! 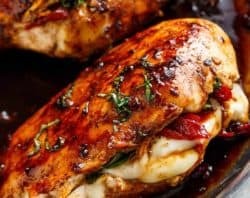 I cooked my marinated chicken breasts in the air fryer. They were very moist and delicious. Combined with the other ingredients and boom a meal full of flavour. 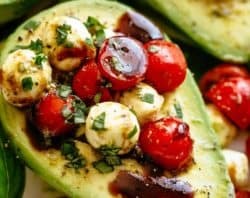 Really appreciate that you include nutrition facts.All of your recipes that I have made have been extremely good.Especially love the ones that include avocado. I made this last night, and it was such a hit. I wish I had made a little more dressing to set aside if someone else wanted more. But it was delicious. Highly recommend making this!! I am new to your blog, but already very impressed. You are upbeat and I can’t wait to try some of these recipes. 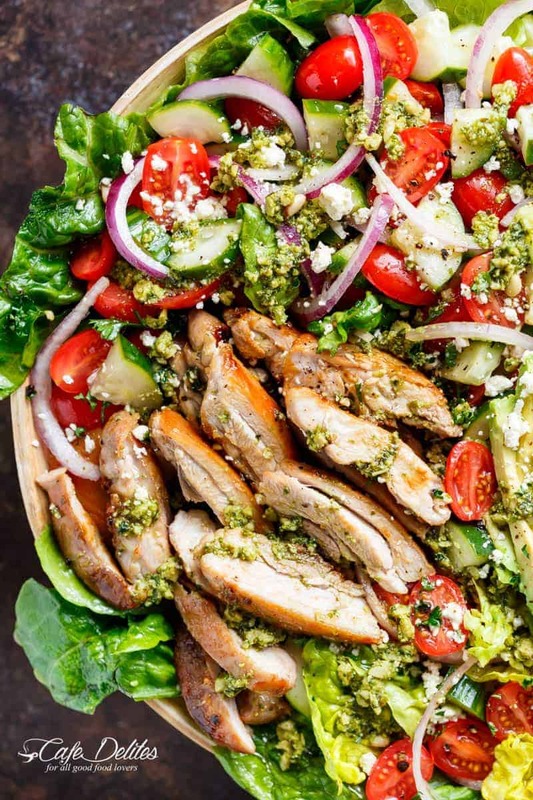 For starters, there’s no way the combo of grilled chicken and pesto could go wrong, and mixing in a salad: YUM! 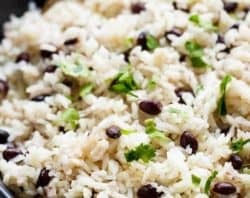 Is this a good meal prep salad. Can I make it ahead of time and store for several days? This time of year is definitely Pesto time. The Basil and Eggplant are about the only thing left in the garden after a great Tomato crop. My wife is old school and doesn’t use a Processor for her Pesto she uses a Mezzaluna and she doesn’t add Pine nuts. Her mother was born in Geneva, the birthplace of Pesto and they claim that the Original Recipe didn’t have them. I even use Pesto as a Sandwich Spread, great on a Mortadella Sandwich(and other Salamis too).